You're going to need extra dorm storage for your dorm room in order to turn it into an effective place to study. College textbooks are bulky college supplies that you may have no idea where to put, especially if you had to buy the college book but won't be using it until later in the semester. Keep your college textbooks and other dorm essentials organized with a dorm bookshelf! You will find a variety of options for your dorm room in this section. You'll find bookshelves for the top of your dorm desk and you will also find Behind the door storage and other dorm organizers. Don't let your college textbooks overtake your dorm desk! Keep them organized in these dorm essential dorm bookshelves that add to dorm room decor! 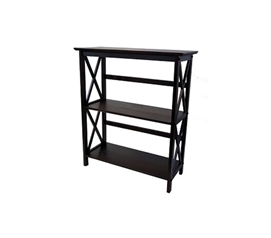 Dorm room bookshelves are considered a dorm room must have college supplies product. It doesn't get more basic than the need to have textbooks and other college supplies stored up and out of the way on a bookshelf. What graduating high school seniors need to know is that some Universities equip their dorm rooms with bookshelves on top of your dorm desk, while others do not. Keep all your dorm stuff organized and reduce your stress and aniety while living away from home and on your college's campus.